Gil Hanke of United Methodist Men speaks about scouting ministries during the 2012 General Conference in Tampa, Fla. United Methodist Men has dropped its affiliation with the National Association of United Methodist Scouters. After years of tension, a scouting organization has lost its affiliation with the Commission on United Methodist Men and other United Methodist organizations. The National Association of United Methodist Scouters is no longer affiliated with the commission, the National Association of Conference Presidents of United Methodist Men and the United Methodist Men Foundation, said an April 10 news release. Leaders of both United Methodist Men and the national association said that the dispute has absolutely nothing to do with the controversial decision made last year by the National Council of the Boy Scouts of America to lift a ban on gay members. At heart, leaders say, the dispute is about the role of an affiliate of an agency in The United Methodist Church. Craig is a lifelong United Methodist, an Eagle Scout and former Scoutmaster. He continues serve on the board of the National Order of the Arrow, the Boy Scouts’ honor society. Both Craig and Hanke agreed they expect the change to have little impact on the youth-service organizations supported by local United Methodist churches. But they also agreed the break is regrettable. The Tennessee-based association long has raised funds for and distributed Scriptures that include Psalms, Proverbs and the New Testament Boy Scout High Adventure programs such as Philmont Scout Ranch and Florida Sea Base and other scouting camps. The group also has helped promote Scouting Ministries Sunday and the denomination’s Programs of Religious Activities with Youth (P.R.A.Y.) award program, which honors participants in church school, youth ministry and scouting ministries. Hanke said he expected the commission’s office of scouting ministries to continue that work without the association’s help. 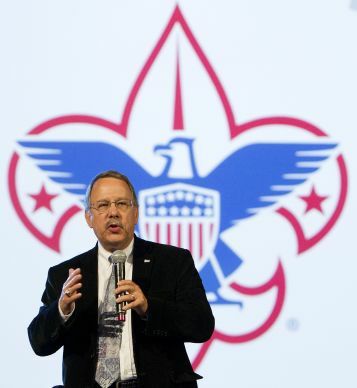 “All the tasks that were part of scouting ministries six months ago are continuing and continuing to expand,” Hanke said. The national association is about 30 years old and has about 2,800 members in its database, said Craig, although he added that the database needs updating. The group predates the founding of the Commission on United Methodist Men — which General Conference, the denomination’s top lawmaking body, established as a general church agency in 1996. The United Methodist Book of Discipline, which contains the church’s policies and procedures, charges the Commission on United Methodist Men with providing resources and support to scouting ministries. The book lists Boy Scouts of America, Girl Scouts of the USA, Big Brothers Big Sisters Amachi Partnership, Camp Fire and 4-H among the civic youth-serving organizations the denomination supports. The book says "Civic youth-serving agencies and scouting ministries offer another setting for ministry to children, youth, their leaders and their families." Both the association and commission have worked to support those ministries, but Hanke and Craig agree that tensions between the two groups go back to almost the beginning of the commission and have lasted through multiple changes in leadership. Craig said association members often felt the commission’s scouting ministries office “denigrated” their contributions. Matters came to a head not long after Craig was elected the group’s president in July last year. The commission asked Craig to attend its September board meeting, where the board presented him with eight tasks for the association’s board to complete to maintain its affiliation with United Methodist Men. The actions United Methodist Men wanted related to business practices and coordination, Hanke said. Craig said the tasks included getting the group’s paperwork in order with the Internal Revenue Service, going through board training and centering its fundraising out of the commission’s office in Nashville. Craig some of the bylaw changes the commission required his board had already completed years earlier and association board members had just gone through training that summer. A particular sticking point, he said, was the commission’s requirement that three of its board members be added to the association’s board. Craig said his group’s bylaws require that its board members have representation on the commission too, but that didn’t happen when new commission members were elected in 2012. The commission was one of eight general agencies with legislation approved at the 2012 General Conference to reduce its board size. The result was that for the first time, association members were guaranteed a place on the commission’s board, Craig said. Craig said his board thinks the commission violated due process in making its demands. Hanke said the commission gave the association every chance to bring its work into alignment. Craig said the association is considering appealing the United Methodist Men decision to the Judicial Council, The United Methodist Church’s top court. He said his group also hopes to affiliate with another United Methodist entity.